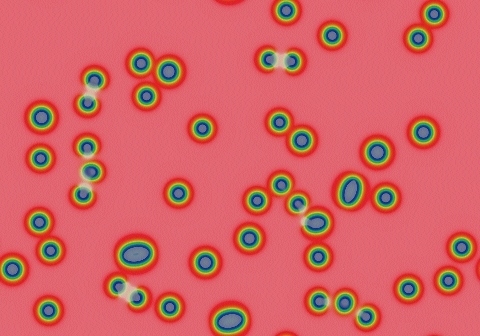 These images and movie demonstrate the behavior of the Gray-Scott reaction-diffusion system with σ=Du/Dv=2 and parameters F=0.1100, k=0.0523. 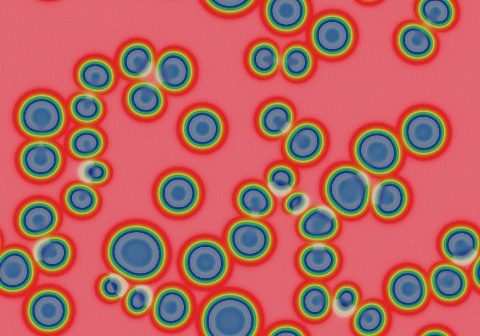 Blue spots on a red background grow to fill the space; larger spots have a bit of an advantage. 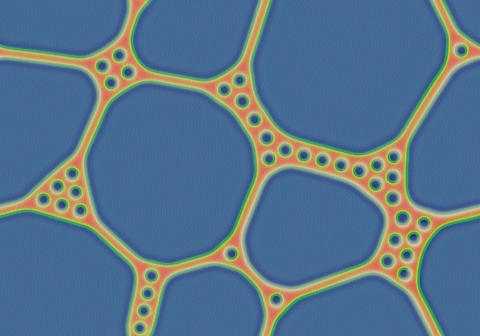 After the space is filled, larger blue spots force the smaller spots to shrink, and edges remain straight whenever possible; negative lines exhibit surface tension. A similar phenomenon is seen in negative to the east. Patterns evolve with homotopy: all spots remain as solitons, clumping at the grain boundaries between the large spots and arranging into a hexagonal close packing. There are six large regions at the end of the movie. After another 1,300,000 tu the region to the lower-right has been reduced to a soliton, precipitating more rapid reduction of two neighboring regions. After that, evolution continues at a much slower rate.